Tuesday’s shift was pretty barren. I went first to Hampstead and tried (and failed) to find the place where I found the big fur last week. After coming up empty I went to Ville St Laurent. There I found some odds and ends but nothing worth posting about. The most notable thing was this beautiful matching couch and chair. My friend, Sarah, and I loved them and were prepared to throw at least the chair into the car. However, out of the corner of my eye I saw something on one of the cushions and took a closer look: It was a bedbug. I put everything back (all the cushions were in the bin). It was a bit scary because I felt my usually sound judgement slip, but I think the experience was a good reminder not to take anything for granted and to not be too starstruck by nice vintage furniture. On the way back home we stopped in Park Ex to get some pastries. 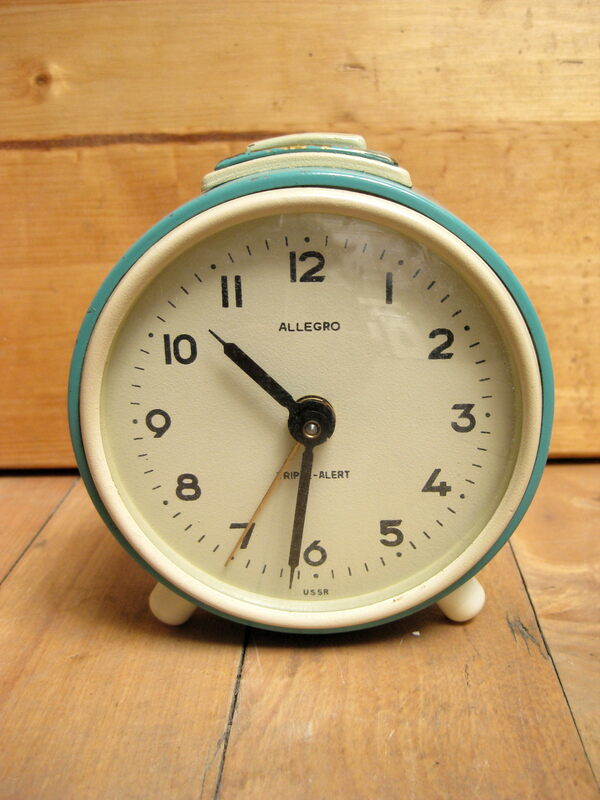 Park Ex also has a Tuesday morning pickup and that’s where I found this nice old Soviet-made alarm clock. It’s pretty cute and still works perfectly fine. I figure it’ll go for 5$ at a yard sale. This morning in TMR was much more successful. This is the spot where I found the camcorder last week. … but there were a few fancier bits as well. 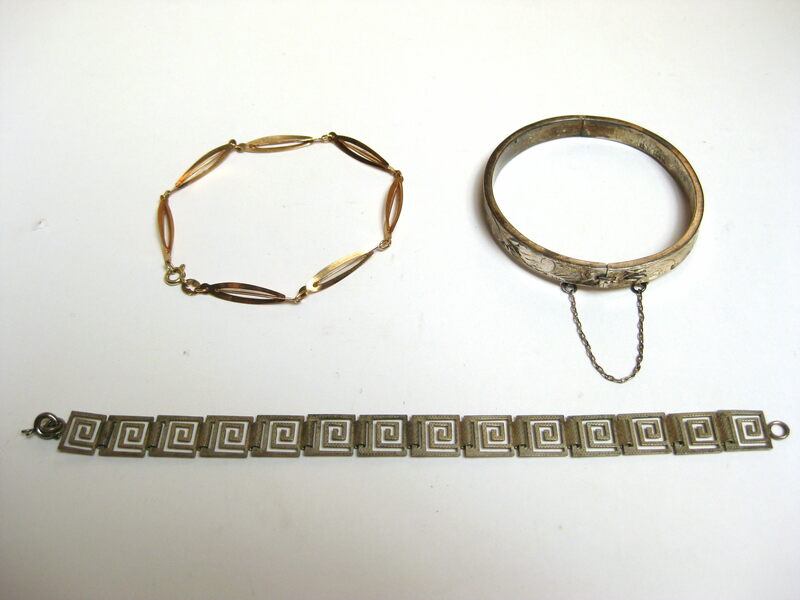 On the top left is a bracelet marked 585 (14k gold). It’s pretty cool and in good condition. I think it’ll sell for 70-80$ in my Etsy store. 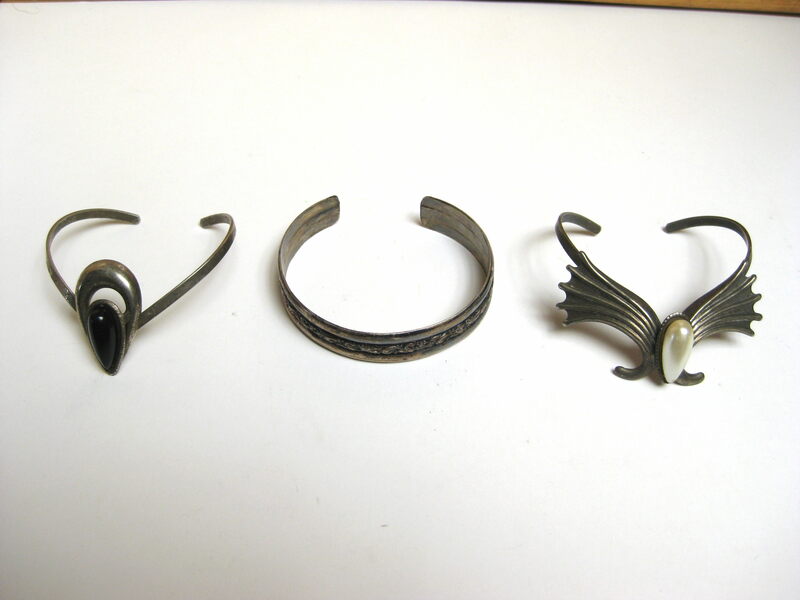 Top right is a 925 sterling silver bracelet which would probably sell for around 35-40$. On the bottom is a bracelet with an odd “1000” mark. I don’t know what that means, though the piece looks fairly silver-like. It’s a classic style regardless. These pins are interesting. 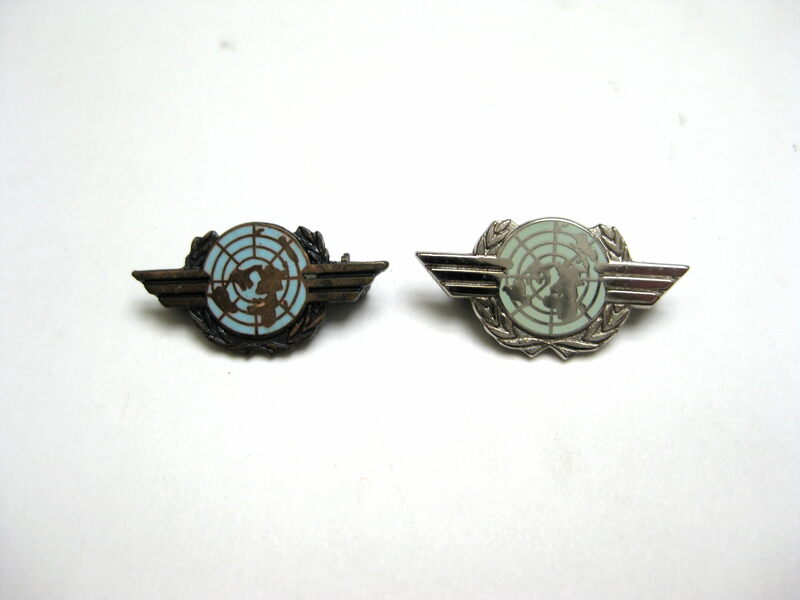 They seem to feature the flag of the United Nations but also have a sort of air force “wings” things going on. The one on the right is marked Birks Sterling while the left is marked simply Birks. I’d be curious as to what these are and how old they could be. I also found some other odds and ends, including this little drum on a stick and a nice casserole dish. Not far away was my friend on Beverley who has been throwing out cool stuff for a couple of months now. They’re presumably slowly getting ready for a move. 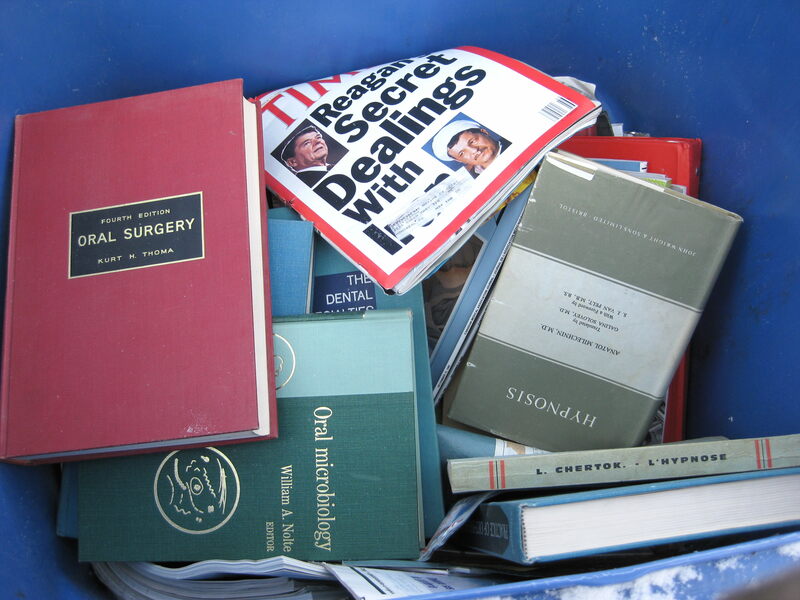 The recycling bin was totally full of old books and magazines the majority of which were related to dentistry. 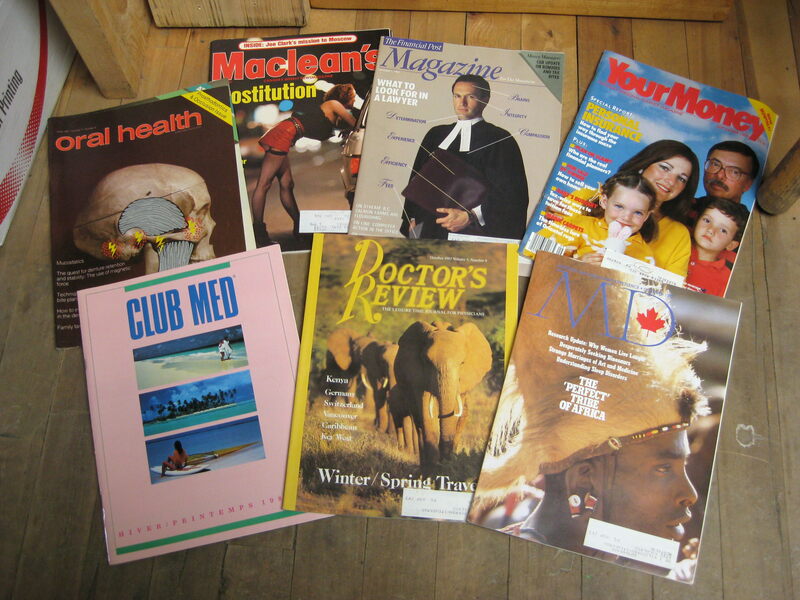 I took a small selection of magazines I thought could be fun to look through. Most are from the early to mid 80s. 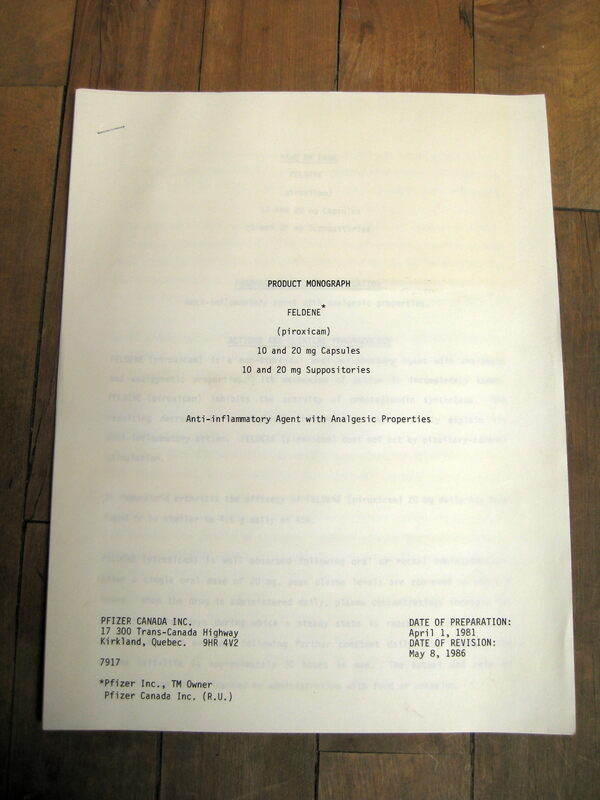 Also in the recycling bin was this product monograph for a drug (“Feldene”) from 1986. Apparently a monograph is written after a drug is fully tested and gets approved by the regulatory agency. 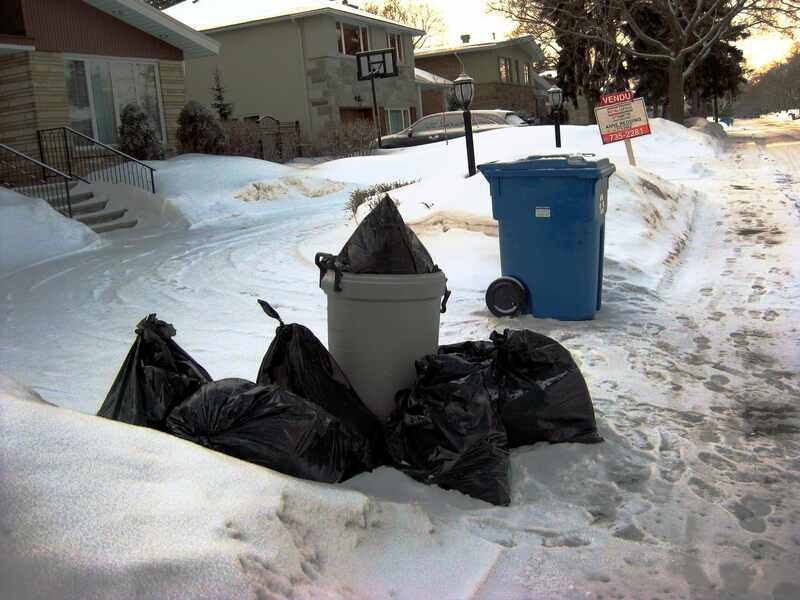 One black trash bag contained five pieces of framed art. Four are by the same artist, someone named Ludo Pollak. I did a bit of googling but didn’t find too much, though he did seem to be a local painter. We came across this pile closer to the end of the route. 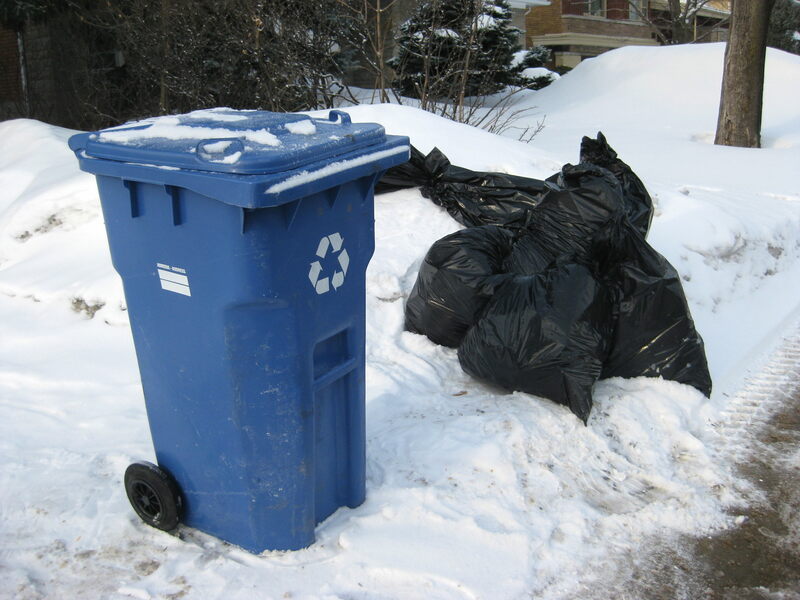 While I was looking through the recycling bin the garbage truck came and took away most of the trash bags, meaning I missed out on some potentially cool stuff. It’s unfortunate but I still made off with some good finds. Inside the bin was someone’s old stamp collection. 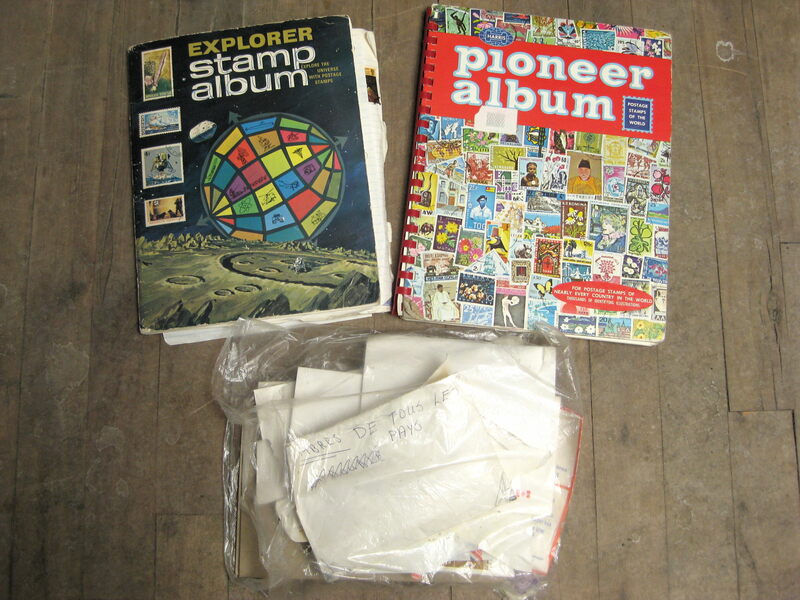 The stamps looked to have been accumulated during the 70s and 80s. 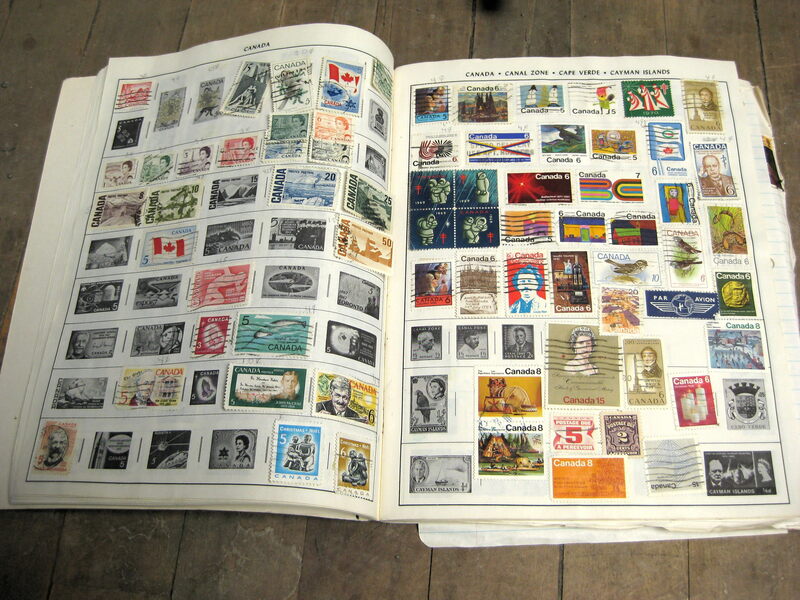 The books aren’t totally full but there are still a lot of stamps including the ones in the envelopes (bottom). 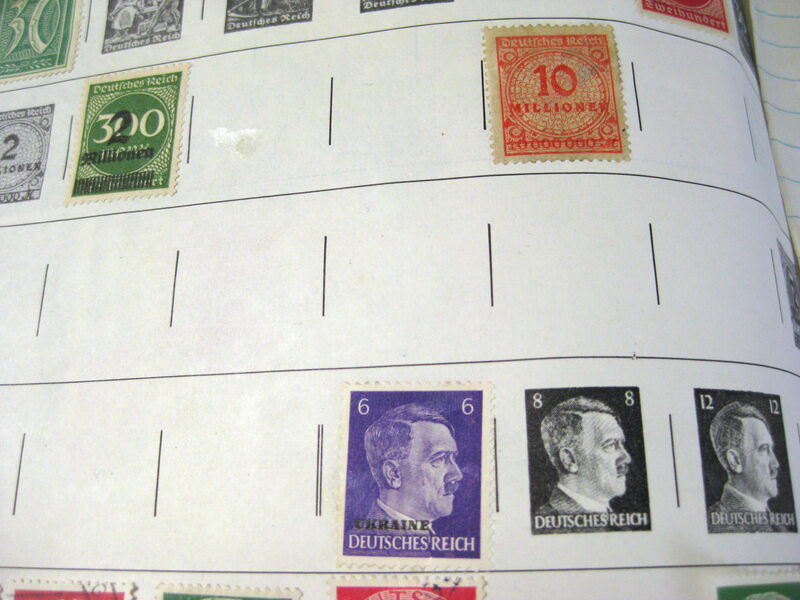 These old German stamps are particularly cool. The ones at the top are from the the period of hyperinflation that took place in the early 1920s (“10 millionen”) while the one at the bottom is from the war. None of these are worth much but they’re still pretty interesting. I think I’ll remove all the stamps from the books and envelopes, put them in a tin of some kind, and sell them at yard sales for 10c a piece. 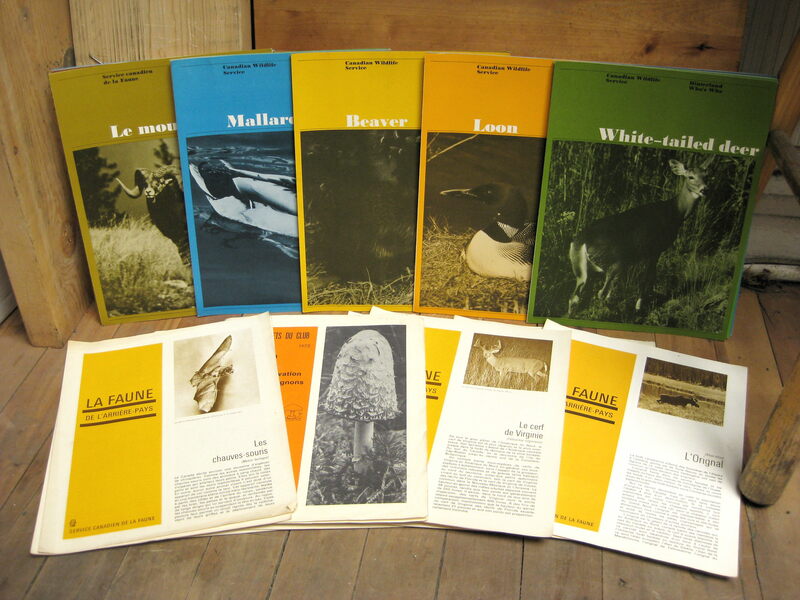 … as well as a whole lot of government pamphlets about the environment, animals, and fish. 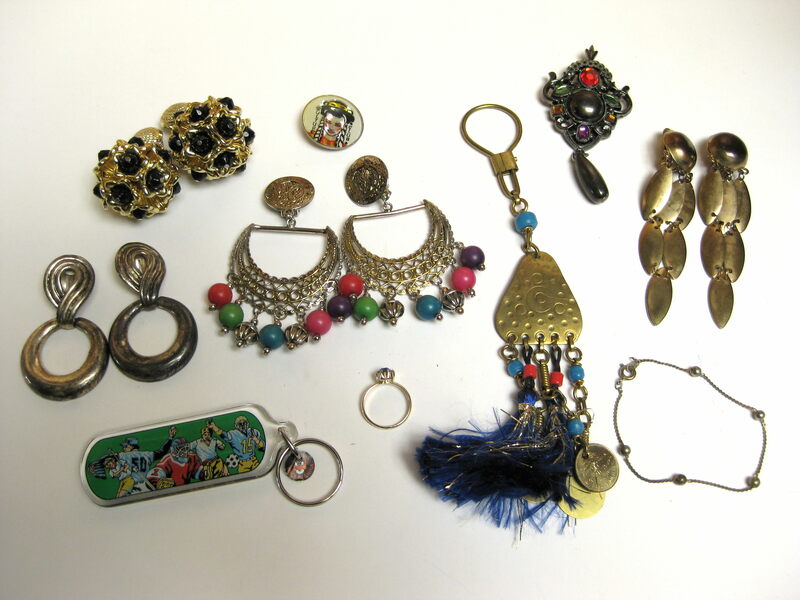 Most seem to be from the 70s but some look to be from the 50s and 60s as well. A few were cut up, from the looks of it a kid used the pictures for scrap-booking and school projects. This pamphlet might have been my favourite find of the day. 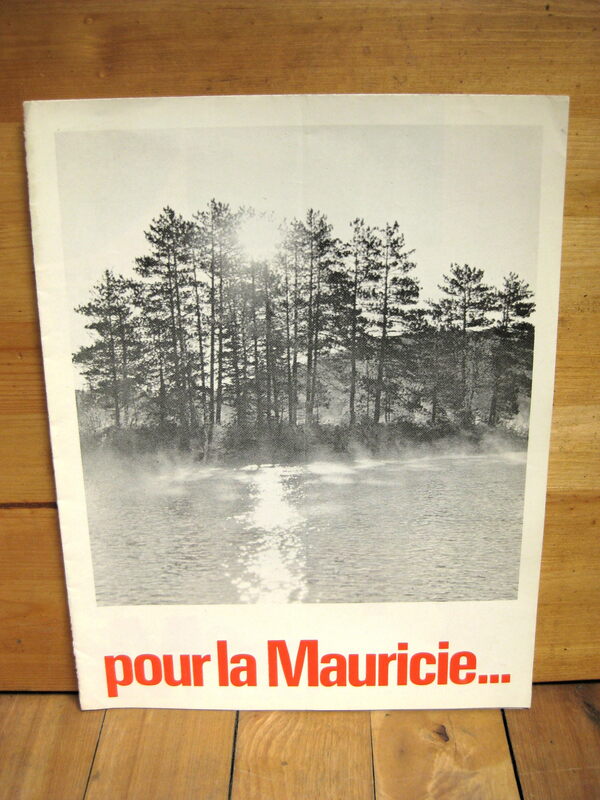 It was published by the campaign of Jean Chretien back in the early 70s when he was running as the incumbent for his seat in Mauricie. For those who don’t know Jean Chretien ended up being Prime Minister of Canada for 11 years in the 90s and 00s. Regardless, he was already a fairly prominent politician at this point and thus almost certain to win (he did win) but it’s always good to have a good pamphlet. This is a cool little piece of Canadian political history. I’m starting to get truly sick of the cold but I still plan on going to Rosemont tomorrow morning. I’ll let you know how it goes! again, wished I lived closer. would love to have a better look at the Pollak art. somehow they appeal. searched for them, think I found a bit about him. Eight paintings by Artist Ludo Pollak will be included in the items for sale at Northwood’s Annual Dinner-Auction, Friday at the Breakers. Pollak was born in Rumania and studied in Budapest and Vienna. In addition to his paintings he has done 32 cartoons and 12 puppet films. the silver 1000 could mean pure silver since 925 means 92.5% silver. but quite unsusual has normaly marker 9999 at best since they can never truly get all impurity’s out. Wow! 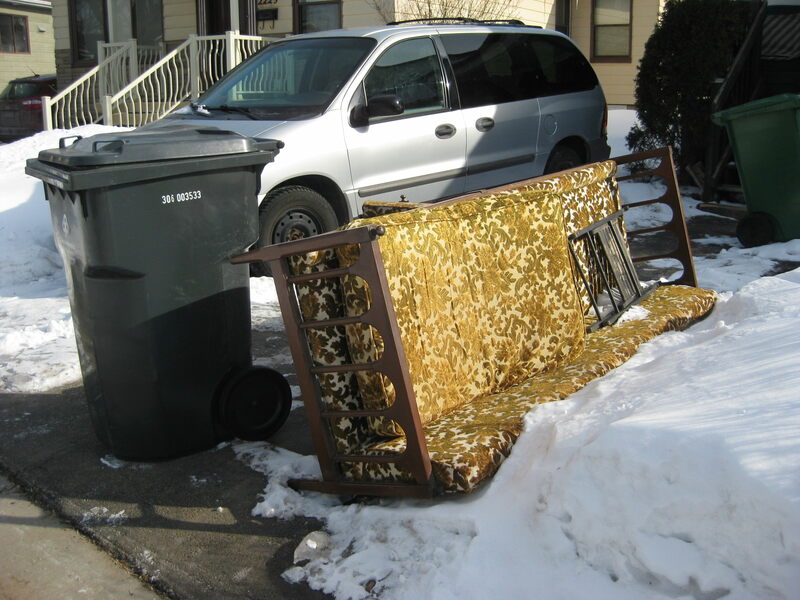 The upholstery on that gold sofa is identical to Jim’s old couch. Really eye-popping. Too bad the thing was buggy. In the 5th photo … are those finger rings? The first and third are quite striking in style, particularly the third. Are they silver? 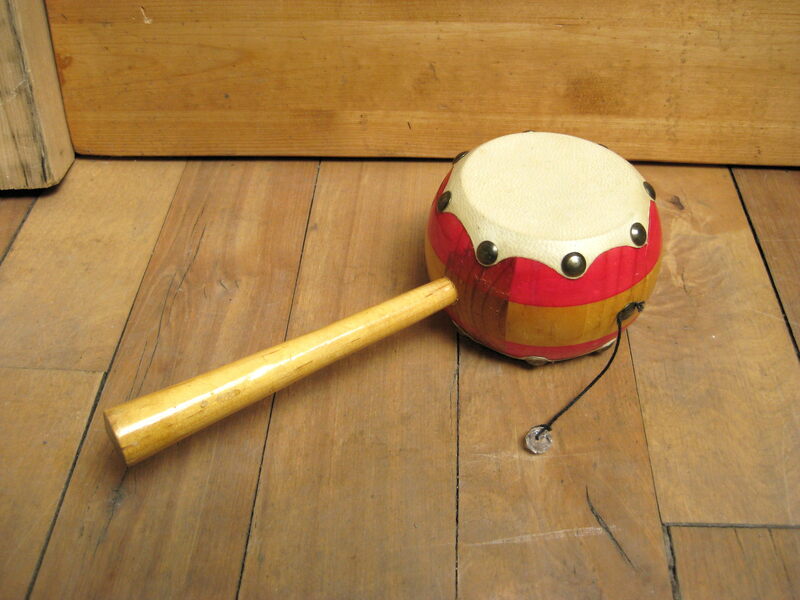 That’s a whirling drum (and much nicer than the ones I found on my Google search, actually) … played by holding the stick between your hands and whirling the drum back and forth. They’re mostly made in India and run-of-the-mill ones sell for about $14 new. That framed art is very nice. Ludo Pollak was born in 1914, so he’s be 100 now, if he’s still alive (and I wasn’t able to find an obit for him). He’s listed here http://canadianillustrators.wikidot.com/p as a graphic designer. 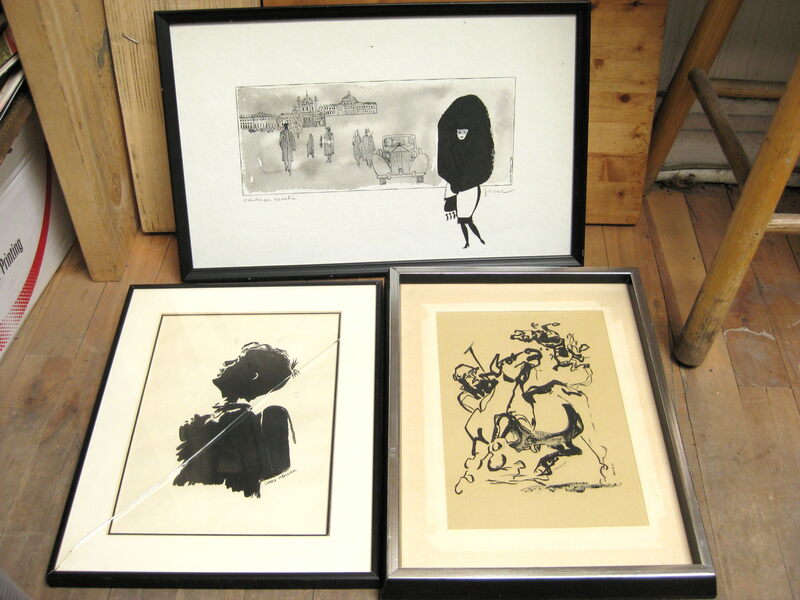 You might get some dollar for those, because they’re quite nice, and well-framed too (à la 1980s frames). Too bad about the one broken glass, but the frame looks to be a standard size, so you should have no problem finding a replacement. I was particularlyt delighted by your finds of framed art and the Newsweek magazine from 1972 from the trash of Town of Mount Royal.I love old magazines about decoration and architecture from the 70s,80s and 90s.If you find old METROPOLITAN LIVING,ARCHITECTURAL DIGEST,TRADITIONAL HOME,and SOUTHERN LIVING magazines in the recycling bins,please rescue them.They have value. “Architectural Digest” was one of those magazines that were common at used book sales, though maybe it was just the same box hanging around year after year, I don’t know. that and National Geographic. 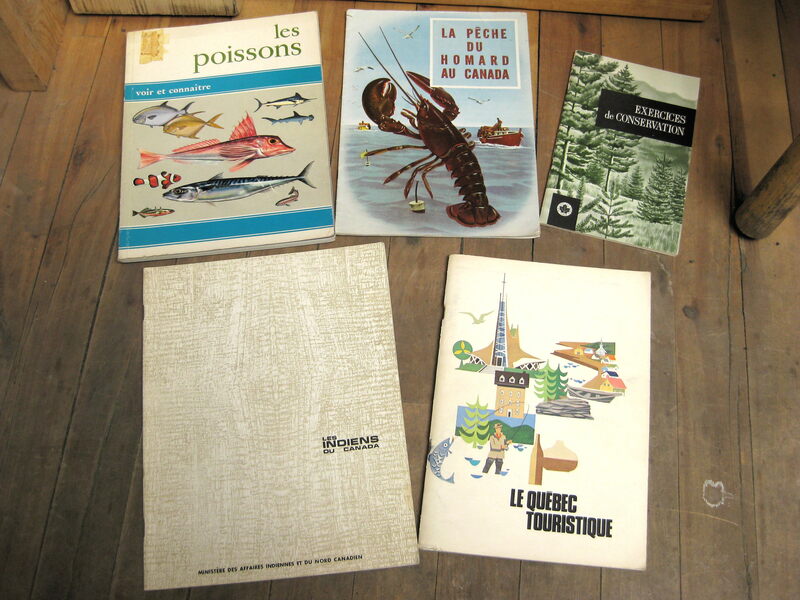 Now, most used book sales don’t want magazines, so the exotic and the unusual are gone as well. They’d get boxes of National Geographic and Architectural Digest, and some Gourmet magazine, and they’d remain when the sale was over. Even at garage sales, I don’t see much in the way of magazines, and even rarer, older ones. A few years ago I found a stray hobby electronic magazine from forty years ago that I’d never read, and got charged a dollar, then came up on a larger and more interesting pile and didn’t buy much for fear of high costs, only for the seller to say “take what you want”. 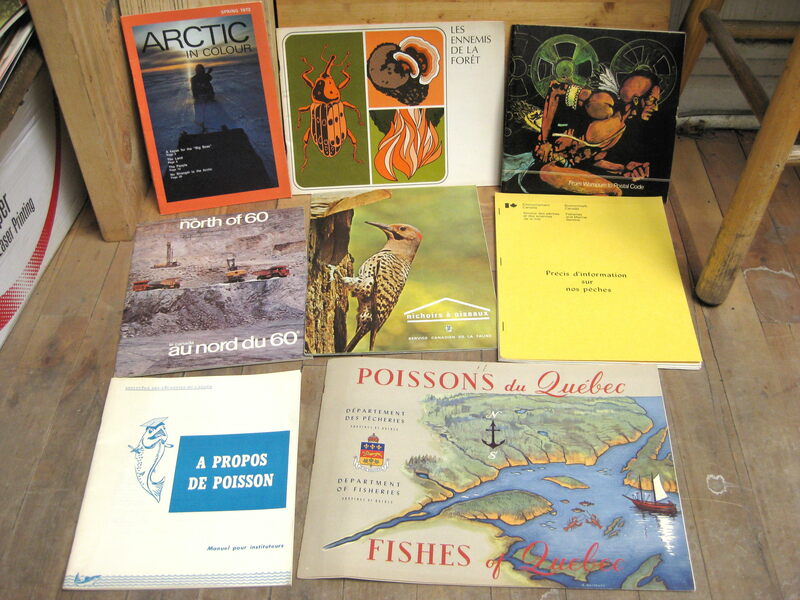 Last year, I found a stack of circa 1973 Popular Sciences in one of those “free book boxes” in NDG, and then found some similar magazines going back to WWII at Encore Books in NDG. Not a large number, but a wide spread. I did buy those. 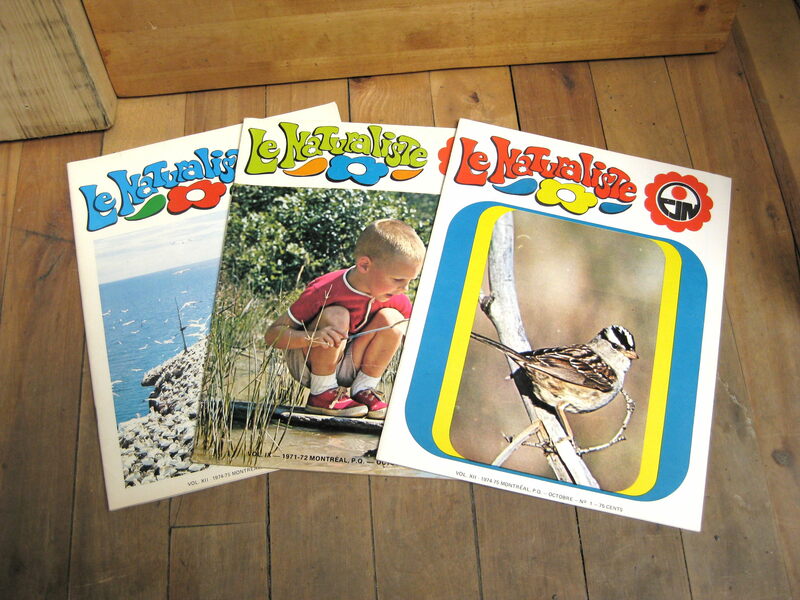 I guess by now, most of the old boxes of magazines have been cleared out. It might be worth asking at used book stores. They probably don’t want them, but if they know someone is interested, they might arrange to notify you for a small amount or something. 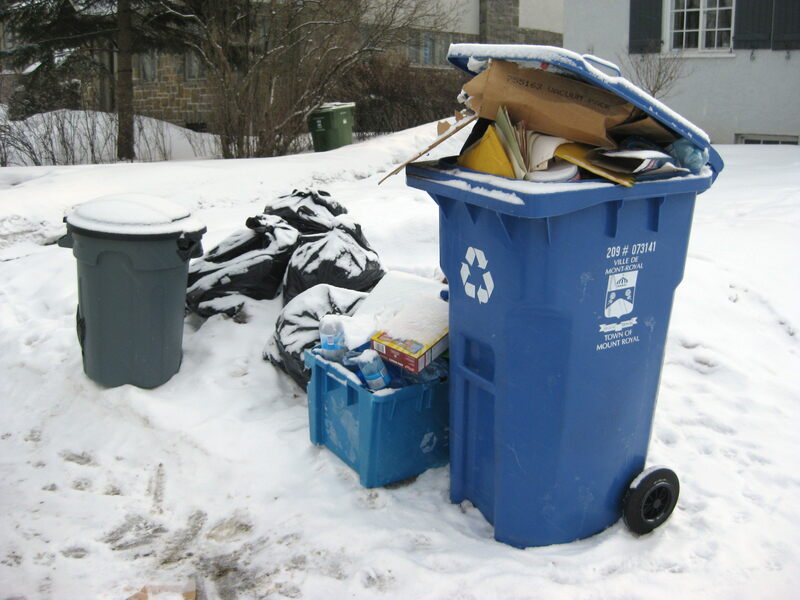 Anyone taking magazines to a bookstore and rejcted is likely to find the closest recycling bin, rather than drag them home. With your car,you are covering a lot of ground.Please go to the newer part of Rosemount,near Langelier ,after Pie Ix.They have a lot of wealthy homes.Also go to Cartierville(the wealthier part) ,Ste.Sault de Recollet in Ahuntsic and Westmount.Westmount is prime territory.